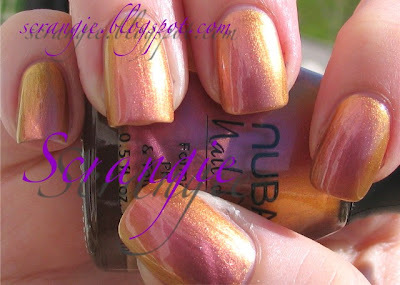 This is my first experience with Nubar polishes, so I think I'll do a little review. Service, overall, was slow and with very little communication. The polishes themselves are awesome. The formula, which is 3 free, seems nice and smooth but still has that annoying dripping problem that 3-free polishes have. The range of colors is excellent, and they have enough of glitter and duochrome shades to keep someone like me happy. The bottles are great, a unique yet stable shape with a comfortable, wide lid. Enough talk, on to the good stuff. Angelic Glitter. Not the most flattering due to the yellow tint, but would be awesome layered over just about anything. Gilded Gold. I love this. You probably can't tell from the picture, but there are little gold glitter shapes in it. Like little triangles of foil, they catch the light and reflect like crazy. Golden Glow. I'm not sure about this one... This could possibly be the most unflattering polish I own. I love the holographic gold glitter. I think this one would be best for layering, unless you have the patience to do 20 coats. Gold Leaf. This is incredible. It's an extremely strong gold/bronze/copper duochrome. It glows so much you'd think it was lit from within. Grass Green. 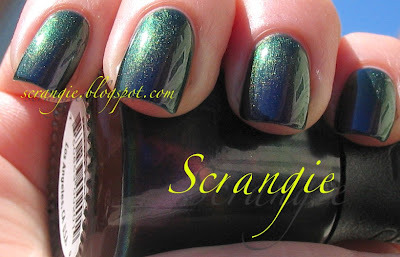 Lots of very fine green glitter. I love this. It's oddly smooth for a glitter polish. This is three coats. Indigo Illusion. It's blue/green/gold/purple. Need I say more? Iris Dust. It seems to be a purple/orange duochrome that changes a lot depending on how the light hits it. Yes, those two pictures are of the same color. Love Rainbow. In the bottle it looks like blue/pink/silver duochrome, but on the nail it looks kinda blueish silver. My only true disappointment out of the bunch. Peacock Feathers. This is the one that made me try Nubar. It's amazing. Sometimes it's purple, sometimes it's blue, sometimes green or gold. It's freaking amazing. The lovely Makeup Alley member Love8Brain has much better pictures of this. Purple Beach. It's futuristic looking, isn't it? It's purple/green/gold/grey. Purple Rain. it's dark purple with multicolored and holographic glitter. No Prince jokes required. Sour Candy. 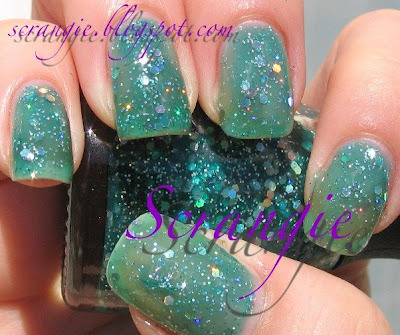 Very cool turquoise jelly tint with holographic glitter. ...And glitter? This is Sugar. 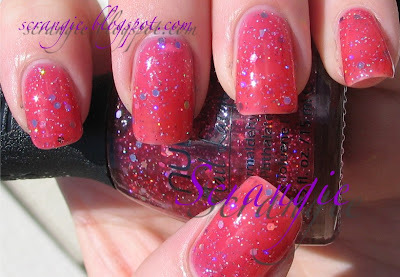 Hot pink jelly with holographic glitter of varying sizes. What do you think? Are these cool or what? I've been lemming a lot of nubar's for a while now, and you just added a few to the list!!! that pink glitter looks amazing on you...like candy! Do you know where they sell nubars online scrangie? Thank you, Tabe-chan :) I got mine at www.bynubar.com! 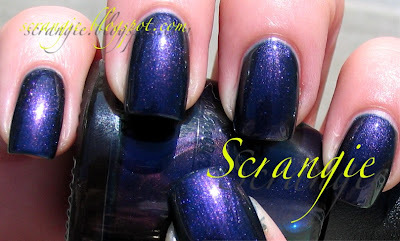 I would expect something a lot more from a polish named Love Rainbow. :) I adore Peacock Feathers and Purple Beach! Shryh, I thought so too! That's some lame rainbow, lol. Emelie, you need it :) We must have good taste! They all look amazing! Especially the duochromes. They have some of the best duochromes I've ever seen! I must have weird nails I tried they're hot yellow and my nails are still yellow more than one week after I tried it. I found that weird. Never happened to me with any nail polish before that the color stayed. Hey Anon, I think it's pretty normal. Some of the polishes stain way more than others. My nails are always stained because of the dark colors I wear, but it doesn't bother me because I'm always wearing polish! You can try soaking your nails in a weak bleach solution (bowl of water and a capfull of bleach) or I've also heard that denture tablets work well too! Thanks, :) been about one month my nails are yellow. They're soon grown out of yellow though. I've never seen that with any other nail polish. Hiya! I know this is an old post but I've been trying to find the 'perfect' copper nail polish. 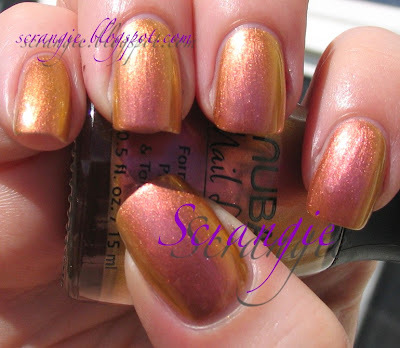 Where can I purchase Nubar's Gold Leaf? Hi Scrangie! Finally broke down and bought the Nubar colors I've been lemming for a while now. I'm rocking Iris Dust right now. (loves it!) The polish seems to be pretty sheer but the colors seem opaque in your pics. How many coats did you use and did you use a ridgefiller to avoid VNL or did you notice VNL at all?? I used 3 coats on top of my regular base coat and still seem to have VNL. Love your blog. Your photos are always on point. Desperately looking for an old bottle, partial bottle, or full bottle of Nubar Peacock Feathers. I can't find it anywhere!!! The last bottle I saw sold for $80 on EBay and I haven't seen another all year! I notice you've had yours awhile, interested in selling some of it or trading? Know anyone else that might? Nubar says they had to discontinue it because the pigment isn't available.....they are looking to find another pigment but it will "be awhile" but I can't seem to find a site where I can post for someone to see it so I'm forced to write everyone, one at a time! I got the nail polish bug after all the duochromes came and went!! I'm having to but them all with hefty price tags but I'm doing it!